Ahead of the Autumn Statement, Greens have unveiled a five year £200bn infrastructure investment plan. Meanwhile, across the pond, Trump has promised his own trillion-dollar investment programme to help grow the US economy by four per cent a year and create 25 million jobs. But agreeing the scale of investment we need to be making at this time is the only thing Greens and Trump are likely to see eye to eye on. Trump is promising the earth, while systematically setting about destroying it. Key to his infrastructure plans would be lifting restrictions on fossil fuels: ending the ‘war on coal’ and giving the green light to the controversial Keystone Pipeline running from the Canadian oil sands; a scheme rejected by President Obama. Trump has also pledged to scrap the $5 trillion dollar Obama-Clinton Climate Action Plan; canceled billions in payments to UN climate change programs; called global warming a hoax and promised to quit the Paris Agreement. By contrast, the guiding principle for Greens is public investment is tackling climate change, which is the most important and urgent crisis facing us. To this end, our flagship investment would be a massive, nationwide free home retrofit programme, concentrating particularly on areas where fuel poverty is most serious. At a cost of £45bn over five years this could insulate nine million homes and take at least two million homes out of fuel poverty, creating well over 100,000 jobs in the process. We would also seek to provide 500,000 social rented homes by spending £6bn a year over five years by removing borrowing caps from local councils, which would create around 35,000 jobs. Quantitative easing (QE) – the mechanism whereby central banks put money into the economy – would be used to support the green transition by investing directly in green sectors of the economy. While Trump wants to give power back to the polluting fossil fuel industries and enact massive tax cuts for corporations, we would generate public investment by making the polluter pay and through increases in taxes on the wealthy. We also want to generate and free up investment funds by lifting the borrowing cap on local authorities and through the expansion of municipal bonds. Of course, our own government has been keen not to be left out of the new appetite for investment. The prime minister has emphasised the need for an ‘industrial strategy’ and chancellor Hamond has signalled an end of austerity and a return to public investment. 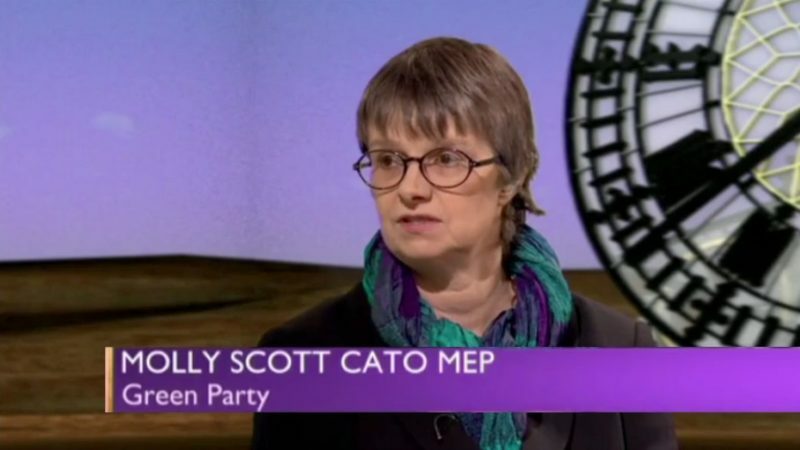 The Green Party has always been clear that austerity was a politically motivated economic policy, aimed at shrinking the state and enhancing the power of private capital. Given that the public finances are in a worse state now than when George Osborne became Chancellor, we can see that austerity was always a political ploy. The economic consequences have been severe and destructive: reducing taxes has led to vast reserves sitting on corporate balance-sheets rather than circulating in the economy and our infrastructure, so essential to the productivity of most enterprises, has been left crumbling. Even more severe have been the social costs of austerity with reduced social safety-nets and increasing inequality. Osborne’s economic policy was primarily performative: far from mending the roof he allowed the UK home to fall into further disrepair while literally preventing local authorities from borrowing to build the real homes people need to live in. There have been heavy hints that we will see renewed government commitment to public investment, particularly in infrastructure, in this week’s Autumn Statement. Transport is likely to figure highly on the list with trunk roads, high speed rail and airport expansion – of which the approval of the third runway at Heathrow is just the precursor – in the chancellor’s sights. Despite the Hinkley C fiasco, new nuclear power will be the token item presented as necessary to meet the need to fight climate change. We believe these are the wrong priorities, which will simply lead to a new procession of white elephants belching out carbon as they go. We need above all to make real progress on the path to building a sustainable, self-sufficient and secure energy system, and to build a lower carbon public transport system accessible to all. We also need to address the major social problem of the age, the lack of social housing to rent, by building new council housing where we need to. And we need to be sure we quickly remove one of the major own goals of Brexit, the damage caused to Britain’s world-class scientific community by the withdrawal of European Union funding. While May’s announcement of a £2bn annual fund for scientific research and development is welcome, Greens would increase this dramatically, ensuring and extra £25bn over the next five years; R&D in areas such as novel forms of renewable energy and energy storage are vital in building a sustainable economy. The monster about to enter the White House is a reaction to mainstream parties ignoring the real needs of the people. Trump has tapped into and exploited the despair felt by so many who feel the American dream has turned to nightmare. But ultimately he will reward and serve the interests of those who really put him in power: Trump’s investment plan will aim to make fossil fuels great again. Greens on the other hand seek public investment for the common good. The Autumn Statement is an important opportunity to close the lid on the coffin of austerity. But when the chancellor loosens the purse strings it must be to invest in the nation’s many social needs and to facilitate the green transition that climate change demands. Your views are so 1990s! Windmills do not produce enough electricity to do all the things you need: hence the rise in prices. Solar panels in Britain do not produce electricity at all. Tidal stuff costs an awful lot of money. China and India and now Germany are building reliable and cheap coal fired power stations anyway. Climate change is up for serious discussion at last. Which is why nobody votes for you.